Fatah's official Twitter feed directly calls for more attacks in the capital, a day before Tuesday's double attack that left 3 murdered. The Fatah faction of Palestinian Authority (PA) Chairman Mahmoud Abbas continues to step up its incitement to terrorism, and just this Monday made an open call for attacks in Jerusalem - a day before three Jews were murdered in two attacks in the city. 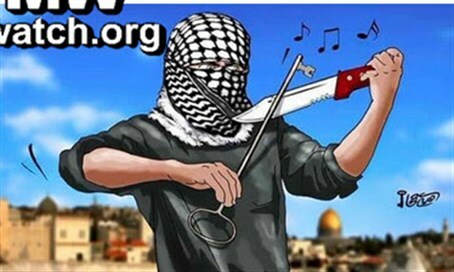 Fatah posted on its official Twitter account on Monday a cartoon, showing a masked terrorist playing a knife as a violin and using a large key as a bow symbolizing the "return" of Palestinian Arabs, reports Palestinian Media Watch (PMW) which revealed the tweet. In the background, the Al-Aqsa Mosque and Dome of the Rock on the Temple Mount can be seen, in a common motif of incitement by the PA as illustrated by Abbas's call last month for violence to stop "filthy" Jews from visiting the holiest site in Judaism, that came amid praise of "blood spilled for Allah." The text in Arabic reads: "a symphony of love for Jerusalem. If the occupation wants to hear it again and again, it should continue invading Jerusalem, attacking our noble women and desecrate our Noble Sanctuary (the Al-Aqsa Mosque plaza - ed.) and our Jerusalem." As noted, the tweet came a day before two nearly simultaneous attacks. In one, two Arabs armed with a gun and knife murdered two Jews and wounded fifteen others on a bus in the southeastern neighborhood of East Talpiyot. In the second attack, a terrorist employee of Bezeq used his company car to attack before getting out and stabbing passersby. One Jew was murdered in the attack, and another moderately wounded. The tweet is par for the course for Fatah's official Twitter feed, which just last Friday posted a picture of a masked Arab terrorist with a rock in his hand ready to throw at Jews. "Rock, rock, a rock in my hand, and my blood on my second hand. With them I have defeated death and fate... #the_rage_of_Jerusalem," reads the accompanying Arabic.